Cook the oatmeal, cocoa and the water in the microwave for 1 1/2 minutes or cook on stove top. Add in the mashed banana and sweetener. 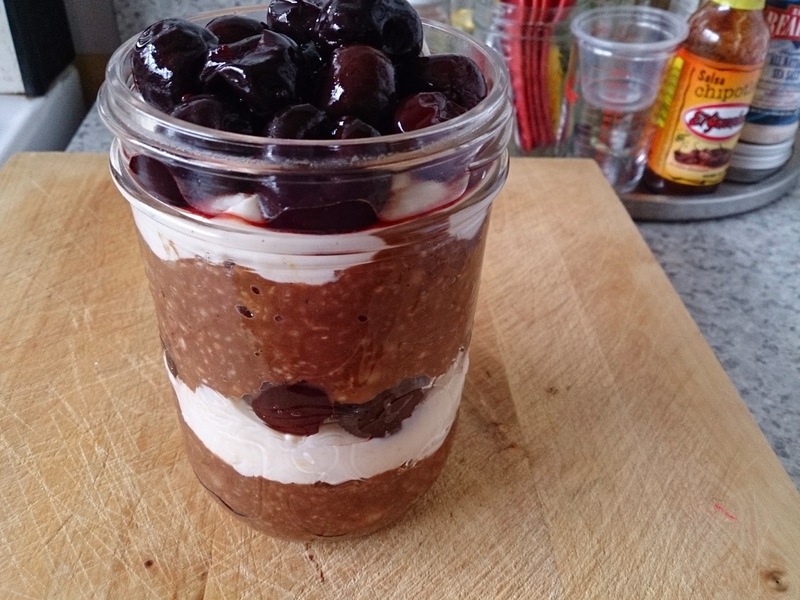 Now layer the oatmeal mixture, yogurt and cherries. I usually make 2 layers of each in a mason jar. You could make this the night before but I prefer to make it just before I eat it. Beware this is really filling which is great if you have a busy day :) If you don't have as big of an appetite as I do just use 1/4c oats. Looks awesome!! I just found you on Facebook - can't wait to look through your other recipes! Thank you so much for sharing! Can't wait to try it. I made this for breakfast....yummy, tomorrow am I making it with blueberries. Thanks for the great recipe.